This pattern is the perfect gift for a baby shower or a great blanket to donate to your favorite charity. With the stitch design there is minimal holes for little ones to poke their fingers and toes through. This pattern features a video to walk you through the wonderful design and makes for good understanding of the construction. 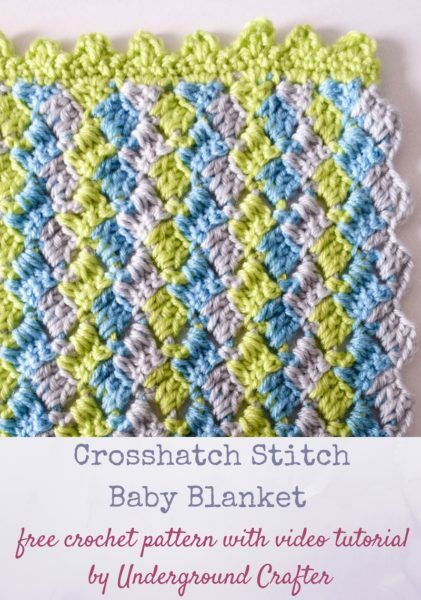 Make this beautiful baby blanket that will be treasured for years to come! Premier Yarns Deborah Norville Everyday Baby (Solid) yarn (100% acrylic, 4 oz/113 g/308 yd/282 m) – 2 skeins ea in grey (CA) and green (CC), or approximately 410 yd (375 m) in ea of two colors in any light weight yarn. Baby Blanket: 31″ (79 cm) wide x 32.5″ (82.5 cm) height.